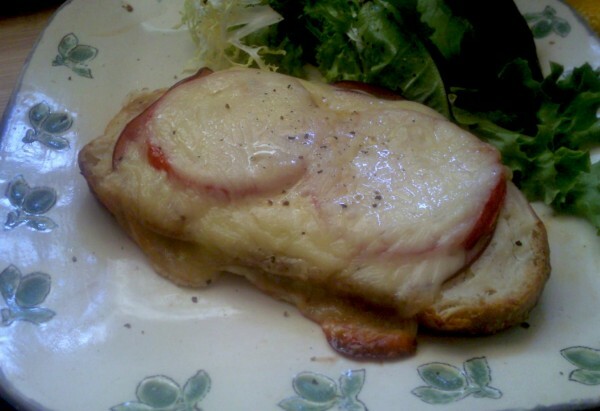 Open-faced croque monsieur is delicious hot, cold or in-between. Just like revenge, sometimes dinner is best served cold – or at least at room temperature. It’s pretty comfortable here in California, but for the rest of the country, the idea of heating up the kitchen with the oven sounds pretty unappealing. So the bloggers in the #letslunch group decided to share our favorite cold dinners this month. Whipping up a salad makes for a cool and easy meal, but I decided that that makes it too easy. Croque Monsieur, the French grilled ham and cheese sandwich, is one of my favorite meals to eat lukewarm or hot from the oven. It takes a little time to whip up the bechamel, but aside from that, it’s as easy as toasting cheese on bread and so much more satisfying. There are lots of ways to present it, but I like Croque Monsieur open faced and topped with juicy summer tomatoes. Slice bread about 1/2 inch thick. Drizzle with olive oil and then flip over. Spread top of each with 1/8 cup cheese bechamel sauce, being sure to take sauce to the edges of the bread. Top each piece of bread with 3 thin slices ham and a slice of ripe tomato seasoned with salt and pepper. Crown each slice with 2 tablespoons shredded melting cheese and then 1/2 teaspoon hard grating cheese. Drizzle each with a little olive oil. Bake at 400 til brown and bubbly on top and crisp on the bottom, about 15 minutes. Let cool to room temperature or just warm, and serve. Makes a great lunch with poached or pickled asparagus or green beans. Melt the butter in a heavy-bottomed pan over low-medium heat. Whisk in the flour. It will be bubbling. Let the sauce cook for several minutes. Watch it and keep whisking it keep it from browning. Remove from the heat, pour the milk in all at once and continue to whisk. Now you can add more milk to make it thinner. Let it keep cooking until it doesn’t taste like flour any more. Once itâ€™s nice tasting, add 1/2 cup to 1 cup of Swiss or gruyere and stir until itâ€™s melted in.